National Manufacturing Week 2013 has been a success for Bestech Australia with more than 120 products enquires and potential orders received on site from new prospects during the exhibition. We are glad our operational and display demos as well as comprehensive product range was able to draw much attention as it did, and we are looking forward to dealing with each enquiry as soon as possible. 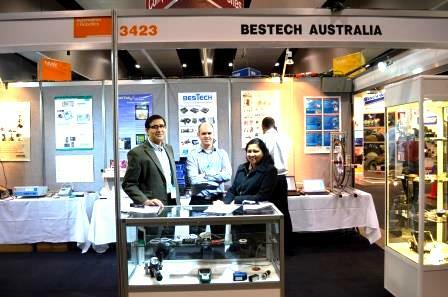 Bestech Australia would like to say “Thank you!” for anyone attended the event and visited us at stand 3423. Meanwhile, if you missing the chance of examining our state of the art laser measurement, eddy current, capacitive sensors, UTMs, pressure vacuum leak detector, package leak testing machine, accelerometers, load cell and force transducers, pressure transducer, pressure gauges and calibrators, strain gauges and data loggers, as well as our newest series of technical training systems, please do contact us to discuss your specific application and requirements!